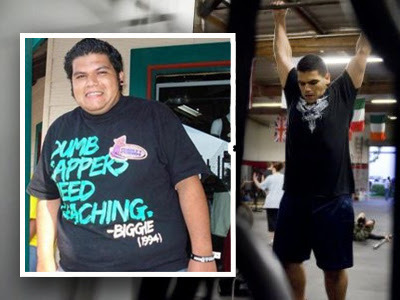 Twenty-three-year-old Ernesto Madrigal has dropped 100 pounds -- 80 of which were lost after starting CrossFit and adopting a Paleo diet. Madrigal was attending only once or twice a week before being challenged by the CrossFit [Brea] staff to come more often...and to change his diet. 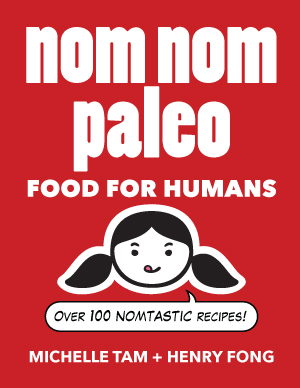 He started eating a Paleolithic, or caveman's, diet consisting of meat, vegetables and fruit. No bread. No grains. No refined sugars. About a year ago, CrossFit Brea held a "biggest loser challenge," which Madrigal won by losing 18 pounds in a month. Since then, Madrigal has become CrossFit Brea's first 100-pound loser in the four-plus years the facility has been open, [CrossFit Brea owner Erik] Arevalo said. As someone I know likes to say, "It's almost like this stuff works."